It's hot out -- especially in NYC -- and swimming in a nice cool pool would be just the ticket, but alas public pools are few and far between. 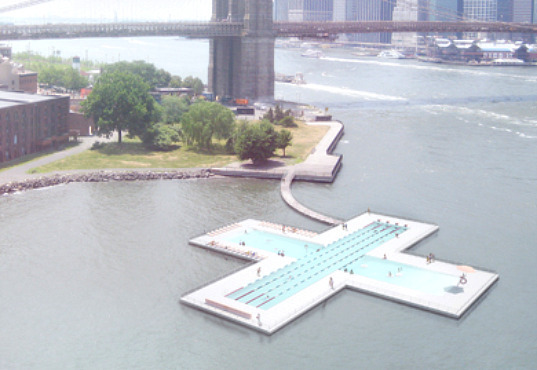 One of group of designers and architects is proposing a floating pool in the rivers of New York City that would actually filter and clean the water while serving as a public amenity to help New Yorkers cool off during the heat waves. + Pool is a fantastic concept for an offshore pool complete with a deck that offers stunning views of the Manhattan skyline. + Pool is designed in the shape of a plus or cross and can be utilized in a number of different ways. With four distinct areas, the floating pool offers a variety of activities for different types of swimmers. Two shallower pools serve as a lounge and kid’s pool, while two deeper pools serve as a lap swim area and a sports pool. The whole pool can be used for larger swim events or opened up to 9,000 sq ft for free swim. 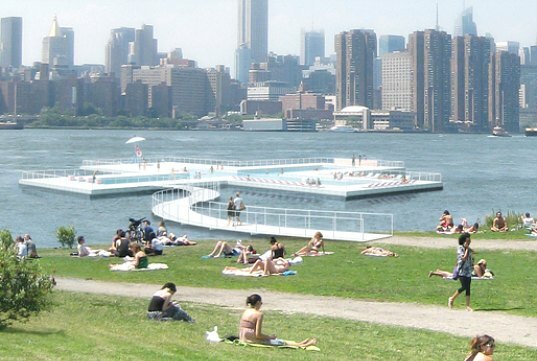 With so many new and developing parks around the city, the + Pool has a wide range of options for locations in the New York City rivers – including East River State Park, Brooklyn Bridge Park, Riverside State Park, Battery Park City, Chelsea Piers or Governor’s Island. The pool would be constructed of concentric layers of water-cleansing materials that remove bacteria, pollutants and odors, leaving clean and safe water for swimming. So this cleans the water without consuming any energy due to these water filtering materials??? Wow! I hope that's the case. Great thniking! That really breaks the mold! Kudos! What a neat way of thniking about it. Thank God! Someone with brains seapks! The public pool would serve as a wonderful public amenity that brings people to the waters of New York City, which were once used more frequently for recreation. The pool could be located at any number of the city's riverside parks, where it would become a destination for families looking for outdoor recreation. The pool would serve as a place for exercise, sports competitions, or just recreation and leisure. The views of the Manhattan skyline from the pool deck would be spectacular. While the pool would be floating in the river, it could be easily accessed via a walkway from the mainland. The pool would also serve to filter water from the river for safe and clean swimming water. The "plus" shape was chosen as a reflection of the city's many cultural intersections - it is designed for everyone in the city. The pool has four independent areas - kids pool, lounge pool, sports pool and lap pool. They can each be separated for distinct activities, or joined together for big swim meets or for open play. The pool wall is composed of concentric layers of water-cleansing materials that filter bacteria, pollutants and odors to provide clean and safe water for swimming. Floating pools, river recreation and river spas have long been part of New York City's history. The + Pool would help revive that tradition. The "plus" shape is iconic and would become a recognizable feature and brand throughout the city.